The ultra-clean work table is divided into two types. One is a vertical and DC ultra-clean work table, that is, the direction of air flow in the work area is vertical, and the other is the horizontal flow, that is, the air flows horizontally through the work area. Generally more common is the vertical and DC Ultra clean workbench, so this article mainly introduces the vertical and DC Ultra clean workbench. 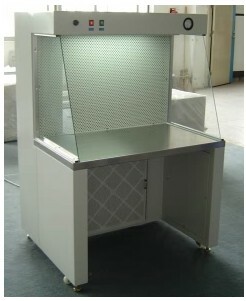 There are two modes of air circulation in the Super clear table: open loop and closed loop. For ultra-clean worktables, the main thing is the process of air circulation filtration. This is the basic means used by all ultra-clean worktables to achieve the purpose of cleansing. In the process, the fan acts as the heart: it pumps the air inside the box. Make it not a loop, update; The box body is like a human body. Its airtightness makes it impossible for the outside air to invade and provides air circulation. An efficient air filter captures the dust in the air and cleans the air through it. Here, it should be noted that the ultra-clean workbench is not clean everywhere. The filter and air circulation mode can only ensure that the air is pure in part of the space after leaving the filter outlet. This space is generally called a working area, only in this area. Operation, Is safe. And the dirtiest, needless to say, is the filter itself. The open-loop air cycle mode is as follows. The main feature is that all air is extracted from the outside world and eventually returned to the environment in each cycle. The ultra-clean workbench with general horizontal flow adopts open-loop mode. This type of ultra-clean workbench structure is relatively simple and inexpensive, but the load of fans and filters is large, which will have a negative impact on its life. At the same time, the clean efficiency of completely open-loop air circulation is not high, and the outer air may carry bacteria in some samples, which may cause harm to the environment. It is usually used only in cases where the requirements for cleanliness are low or there is no biological hazard. Its main feature is that all air is extracted from the outside world and eventually returned to the environment in each cycle. The ultra-clean workbench with general horizontal flow adopts the open-loop mode. This type of ultra-clean workbench structure is relatively simple and inexpensive, but the load of fans and filters is large, which will have a negative impact on its life. At the same time, the clean efficiency of completely open-loop air circulation is not high, and the outer air may carry bacteria in some samples, which may cause harm to the environment. It is usually used only in cases where the requirements for cleanliness are low or there is no biological hazard. It can be seen that the closed-loop mode is not actually a completely closed air cycle. Each cycle will emit 30 % of the air into the environment space, but these outer exhaust gases have been filtered by an external high-efficiency air filter. After 70 % of the gas flows through the working area, it reenters the next cycle process through the guide hole. These gases are relatively pure compared to the air inhaled by the outside world, so that the filter has a smaller load and longer life. This air circulation model is currently adopted by mainstream products. Everyone has their own opinions on this issue. Here are just some suggestions for your reference. No matter how much salespeople flaunt their newfangled technology in front of you, you must pay attention to the fans and filters used by this super-clean workbench. These two things represent the technical level of the product and can not be falsified. Unfortunately, the domestic level of fans and high efficiency air filters is much worse than foreign products, so the domestic production of high-end products are generally imported filters and fans. The ultra-clean workbench consists of three basic components: high-efficiency air filter, Box body, fan, and just the above three parts can constitute an ultra-clean workbench. Of course, such a product will not be purchased, so the manufacturer will install it. Many auxiliary systems, Some are useful, some are boring. Ultra clean workbench is a special kind of workbench. Imported products will take a long time to tell you how to clean and disinfect. Better super clean workbench will have a lot of accessories, most of which are related to cleaning and disinfection. At least ultraviolet lamps should be installed for disinfection and sterilization. Ask the supplier what they have done for the cleaning and disinfection of the customer. If it is found that a product is not suitable for cleaning, do not consider it. It may be good performance and low price, but long-term use will be very inconvenient.